The name Rowsome is ubiquitous in the world of Irish music. Down through the years I have had the honour of playing music with the piping master Leo Rowsome and with his children, Leon, Liam, and Helena. 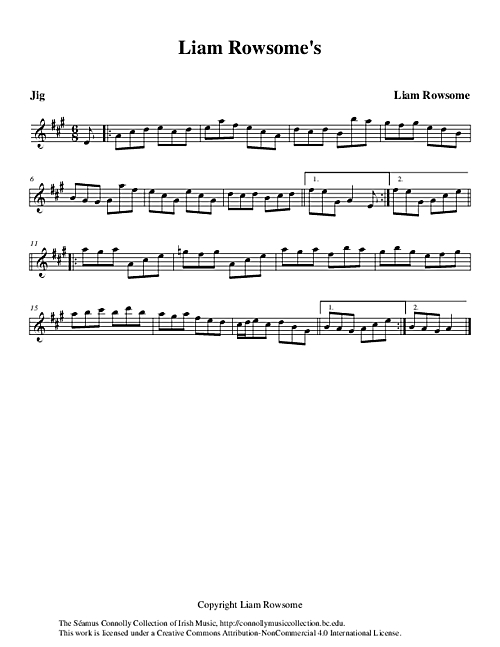 Fiddle player Liam Rowsome composed this tune in the key of A major. It is recorded here by fiddle player Brendan Bulger, All-Ireland fiddle champion from Boston. Brendan chose to play it in a different key. He told me he had fun doing so. Well done, Brendan. Bulger, Brendan (fiddle), Knox, Bill (guitar), and Rowsome, Liam (composer), “Liam Rowsome's,” The Séamus Connolly Collection of Irish Music, accessed April 20, 2019, https://connollymusiccollection.bc.edu/document/459.